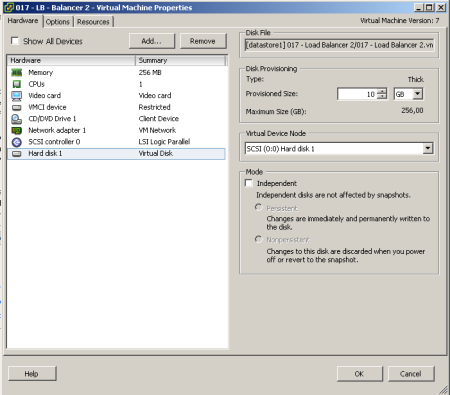 To increase the size of your VMware Virtual Machine, you need to do 2 major steps. First, you need to increase the disk's size in your vSphere Client or through the CLI. This will increase the "hardware" disk that your Virtual Machine can see. Then, you need to utilize that extra space by partitioning it. If you're interested in just resizing your Linux LVM, please proceed to step 2. In this example, I'm increasing a 3GB disk to a 10GB disk (so you can follow using the examples). I would advise you to read the excellent documention on Logical Volume Management on tldp.org. Just a small note beforehand; if your server supports hot adding new disks, you can just as easily add a new Hard Disk to your Virtual Machine. You can increase the LVM volume without rebooting your Virtual Machine by rescanning the SCSI bus, more on that later in this article. It will show you that there are already 4 primary partitions on the system, and you need to add a new Virtual Disk to your Virtual Machine. You can still use that extra Virtual Disk to increase your LVM size, so don't worry. 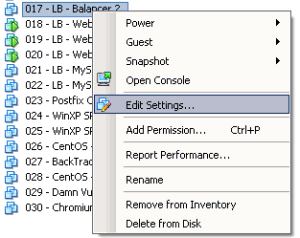 Increasing the disk size can be done via the vSphere Client, by editing the settings of the VM (right click > Settings). Now, depending on the first step, if there aren't four primary partitions yet, you can increasing the privisioned disk space. If the "Provisioned Size" area (top right corner) is greyed out, consider turning off the VM first (if it does not allow "hot adding" of disks/sizes), and check if you have any snapshots made of that VM. You can not increase the disk size, as long as there are available snapshots. Alternatively, if you already have 4 primary paritions, you can also choose "Add..." to add new Hardware "Virtual Disk" to your VM, with the desired extra space. Once you've changed the disk's size in VMware, boot up your VM again if you had to shut it down to increase the disk size in vSphere. If you've rebooted the server, you won't have to rescan your SCSI devices as that happens on boot. If you did not reboot your server, rescan your SCSI devices as such. Then rescan the scsi bus. Below you can replace the '0\:0\:0\:0' with the actual scsi bus name found with the previous command. Each colon is prefixed with a slash, which is what makes it look weird. If you've added a new disk on the server, the actions are similar to those described above. But instead of rescanning an already existing scsi bus like show earlier, you have to rescan the host to detect the new scsi bus as you've added a new disk. It won't show any output, but running 'fdisk -l' will show the new disk. Once you get back to the main command within fdisk, type w to write your partitions to the disk. You'll get a message about the kernel still using the old partition table, and to reboot to use the new table. The reboot is not needed as you can also rescan for those partitions using partprobe. Run the following to scan for the newly created partition. If that does not work for you, you can try to use "partx" to rescan the device and add the new partitions. In the command below, change /dev/sda to the disk on which you've just added a new partition. In that case, you'll need to increase the XFS partition. Read here for more details: Increase/Expand an XFS Filesystem in RHEL 7 / CentOS 7. This article is really well written, clear, to the point, and was really useful. It guided me though a difficult task which I finished successfully on the first attempt. Well done and thanks to the author. I agree with Simon Kirsch. This article could not be more accurate. This works perfect and even on XenServer 5.6. Thank you so much as i was having difficulty doing this. As an alternative you can delete the partition and recreate it with the exact same start sector. Then use pvresize. Thanks…gr8 article and works for me like champ in one go…save lots of time..
excellent article! worked exactly has described. Thank you! Wonderfully explained.. !! Excellent tutorial.. cleared my confusions and I successfully completed my task with your help. Thanks a lot . Excellent! well written, Only needed step 2 but it works! Not a Linux user but was asked to resolve an issue like this. This is a great article BUT I found that we couldn’t get it to work using “LogVol00” in the “lvextend -L+7GB /dev/VolGroup00/LogVol00” and “resize2fs /dev/VolGroup00/LogVol00” commands. Our VG was called system which was easy enough to determine but it took ages to find that our eq to “LogVol00” was “root” (ie lvextend -L+7GB /dev/system/root Once we used this all was working, many thanks. Thanks for posting the solution, Its worked for me. Wonderful Post..It work perfect……Thumbs up to you man! If someone already has the extended partition created then the newly added space will be out of that and you won’t be able to create a new partition just yet. An easy way to get over it is to use “cfdisk” to create a new partition on the free space so to extend the “Extended” partition. Excellent post! Very straightforward – I had tried many other scenarios and pages and this worked first time through. Awesome, you are life saver! Awesome article, worked first try. Thank you! Excellent upto the point How to do article. Thanks for sharing the knowledge. Thank you very much for the sharing!! After 1 day of research on the all wide web you’re the most one clear about this. You are the best work excelent in Centos 5.6 and ESX. Thanx!!! What a well written article…there are several out there, but they all leave out steps or make assumptions about the readers experience. Great article, even someone with next to no Linux experience (like me!) can easily follow these steps. Thank u very much for this tutorial. You save my work place. Thank u again. This is very very useful guide. Great article. Really well written and very useful. My kudos to the author. A very well written article. Absolutely perfect! Thank you for being straight and to the point. Easy to follow and understand, you should be hired to write the ‘man’ pages and the ‘How-To’s’. After looking among dozens of related articles, I was not able to understand what to do. I am new at linux and by reading your article I was able to resize my virtual system in minutes. Thank you these steps are so detail and useful. Mattias, Thank you very much for the great article! Works like a charm. Heartfelt thanks. immensely helped us to resolve. REally good and helpfull. The only issue was how to find out the name of LogVol00 . I found a “lvdisplay” command and then I could catch the name used on my system. It worked like a charm and I’m a linux noob. Best step-by-step LVM extension article on the internet. True that. Glad I found it! Very well written tutorial which works. Thank you! All steps are easy to read and follow. The two articles about increasing the VMDK size and working it through to the xfs_growfs command were both very, very helpful. Thank you for putting this together. a df -h command show the Second HD partition but lvdisplay or vgdisplay they only show the partitions of VM disk. how can i expand this second HD partition ? Great post, thank you for posting this. Tested with CentOS6. Thank you. Great, detailed post. Keep up the good work! Thank you very much! Best guide. Can you give me a advice, how to extend LVM without adding new partition (/dev/sdb3,4,5). How to resize current device (/dev/sdb1 for example) carefully? Can I make it without reboot? Sorry, I lack the time to fully write that one out. You might want to try & ask this question on the Cron Weekly forum at https://ask.cronweekly.com/? Very helpful article. And I know this is a few years old, but I am getting an error in the lvextend command. Maybe you can help? “/dev/cl”: Invalid path for Logical Volume. Run `lvextend –help’ for more information. Finally perform an online resize to resize the logical volume so the data blocks will change and you are done. Even many years after this article was written, it’s still very useful! Thanks. Very good article! This saved me a lot of time trying to search and/or troubleshoot. Thanks! Migrating from an old version of XEN to VMWARE, there were a few different steps. Great article! very good article!!! please keep posting article…..
Have you considered using the scsi-rescan -a command to rescan the scsi bus? It’s found in the sg3_utils-1.37 package. Even though it is now 2018, this article was really helpful and very clear. good article!! , and I have a question, if my linux has 4 partition created, i need delete a partition? if that is correct, when i deleted it. will my data get corrupt? I had some trouble getting fdisk to create the partition properly. I instead used ‘cfdisk’ and got it to work. All in all a very very good tutorial. Great job, author! Excellent. All worked for me . Only I needed to run lvscan to get the Logical Volume for lvextent command. After almost 10 years written continuing to be very useful, I was trying to do after 2 days, and have the luck to see your guide, and really solve my problem increasing 20 G more to my old centos, my congratulation for the very precise article!